Mmmm. A tasty, homestyle meatloaf. I know my Isaboo would love to get her paws on one. Now she can, with my Meatloaf Morsels. Real U.S. farm-raised beef is the #1 ingredient and there’s no corn or wheat! 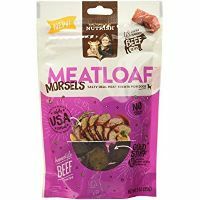 Now Isaboo and your pup can have a savory meatloaf treat any time they like — how fun!